This memorandum describes the process for closing the Orion architecture in DAC-2. It lists the open architecture issues, threats and opportunities and requirements issues that need to be addressed as well as the overall schedule for this activity. 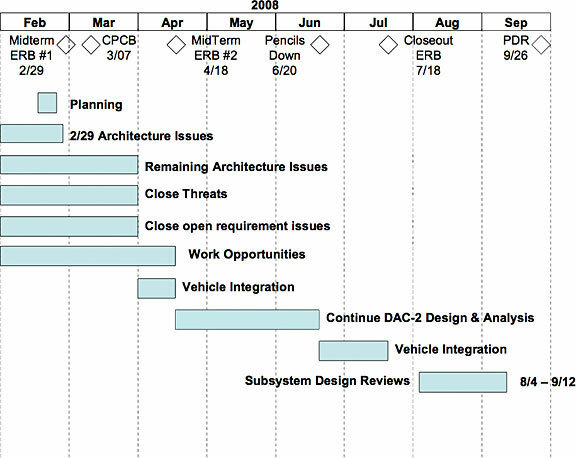 The original plan for DAC-2 had the architecture-level decisions closed by the Architecture ERB that was held February 22d-28th and rolled up to the integrated system by the Mid-Term ERB on February 29th Since a number of significant system-level trades and studies are still open, the project requires an intensive effort over the coming weeks to close these issues in order to proceed with the preliminary design tasks required for PDR. To that end a second Mid-Term ERB is to be held on April 18th. This second Mid-Term is intended to provide a roll up ERB covering architecture level decisions made after the 2/29 Mid-Term ERB. Interim ERBs will be used to make the architecture decisions prior to 4/18 as is normally done. The System Design Products originally slated to be delivered at the 2/29 ERB will be deferred to the 4/18 ERB to ensure they include the salient architecture decisions and form a cohesive basis for the remaining DAC-2 effort. 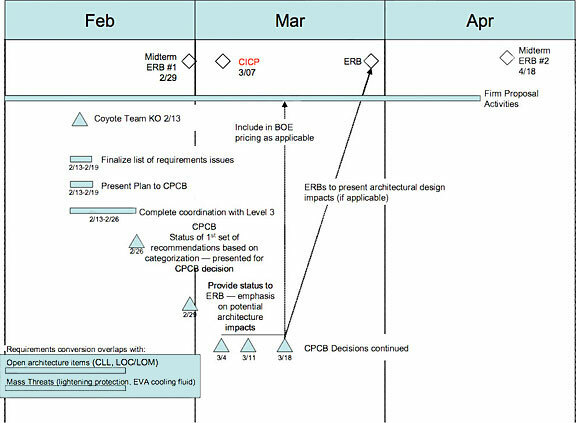 In order to allow time for the integration of System Design Products prior to the 4/18 ERB the architecture level decisional ERBs should be completed by 3/28 to allow CPCB approval by 4/1. Updated mass and power will be provided at the 2/29 ERB in order to assess the current status and gauge the scope of the OVEIWG activity described below. Changes to the Loads/Environments data and the Trajectory Data base will be based on updates derived during DAC2. Any updates that are required due to architectural changes which are made during the March time frame will be provided after the 4/18 Mid-Term ERB as part of the ongoing DAC2 process. The OVEIWG will be utilized as the Spacecraft-level forum to set the technical integration study priorities, negotiate and establish commitments, determine the detailed schedule and perform the spacecraft-level technical integration during the period between now and the second Mid-Term ERB. The OVEIWG will conduct a detailed planning activity February 19th - 22nd review the scope described within this memo. Items which cannot be closed to support the 4/18 Mid-Term, or in-work tasks/TDSs that will need to be deferred to achieve the objectives of this memorandum, will be communicated to project management. Specifically that planning session will result in a schedule for closing the architecture issues and weight threats and opportunities. OVEIWG includes membership from all IPTs and is jointly led by Systems Design and Systems Analysis. It is an integrated working group responsible for addressing spacecraft-level issues that cross modules/IPTs and Subsystem SPTs as well as for the closure of the weight threats and opportunities. The OVEIWG will be responsible to ensure all study results have rigorously identified and characterized the spacecraft-level implications and are incorporated in the integrated system products (listed above). OVEIWG will also forward integrated architecture change packages to the appropriate decision forums. The OVEIWG leadership will work with the IPT membership to schedule the issues to be presented at the working group meetings. In this way collective agreements can be made with participation by the appropriate stakeholders to address concerns and identify minority opinions prior to proceeding to the appropriate decisionmaking bodies. Since the short-term schedule is tight and our engineering resources are spread thin, it is important that those resources do not get conflicting direction. Some of the activities currently being worked at the IPT or subsystem level may need to be deferred to ensure adequate focus on architecture-level issues, closing threats and developing opportunities. The OVEIWG will be used as a forum to determine priorities and to ensure a credible plan for completing the effort to get to a second Mid-Term ERB by April 18th. Conflicts will be adjudicated by Project Management. The following Table lists the salient open items that require resolution in order to proceed with the remaining Orion PDR tasks. The high architecture or programmatic impact items are listed in the top of the table. Obviously there is some uncertainty in this division since the impacts depend on the final design solution. Impacts of reuse are not addressed in this memo but are addressed by the Reuse memo authored by Karl Pohl and dated 2/13/08. Power/Thermal system sizing Power draw exceeds solar array capacity and radiator performance issues. Other critical work includes dispositioning weight threats and opportunities, and resolving open requirements issues such as the incorporation of IS TIM requirements. The importance of resolving weight threats and opportunities is self evident and must be completed to successfully validate the remaking mass margins upon completion of the PDR The open requirement issues need to be resolved to ensure the baseline requirement set for PDR is agreed to and to prevent open requirement issues from of preliminary design and associated PDR products. The OVEIWG and its participants from the IPTs are directed to retire the following threats and opportunities, and either incorporate the weight impact into the baseline or otherwise disposition the threat to support the 4/18 Mid-Term. The specific schedule for working off these threats and opportunities is to be determined during the OVEIWG planning session scheduled for 2/19-22. Additionally, requirements push back judged prudent to offset weight gains should be investigated. Those which require clarification of previously agreed to errata via contract letter. The following table lists the current set of requirement issues. A matrix of the specific requirements with a description of the issue has been developed and is under review. This matrix will be used to document the impact and disposition of each item. The following revised DAC-2 schedule provides a schedule context for the tasks described in this memo.